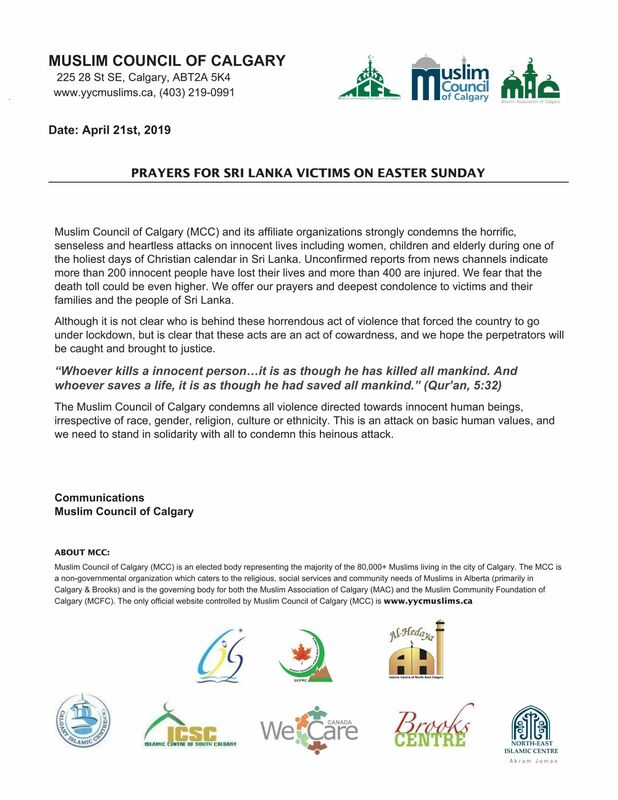 Muslim Council Of Calgary(MCC) and its affiliate organizations condemn the horrific, senseless and heartless attacks on innocent lives including women, children and elderly during one of the holiest days of Christian Calendar in Sri Lanka. Al-Hedaya Islamic Centre is a society incorporated in 2008, and a Chapter of Muslim Community Foundation of Calgary(MCFC, registered Charity) under the umbrella organisation of MCC (Muslim Council of Calgary). It is located in the northeast part of Calgary and it represents Muslim Community Living in Martindate, Castlerigde, Coral Springs, Falconridge, Taradale, Saddleridge, Savanna and Sky view. Our Vision is to enhance the identity of Islam in the society by providing a robust platform to the community members to understand Islam and the Canadian values through leadership, education and collaboration with other organizations. Our Mission is to establish a hub for the Muslim communities north of McKnight to provide a place of worship and an educational framework while contributing to the betterment of the Canadian society at large. Live by the teachings of the Quran the Messenger sayings actions. Demonstrate selflessness, integrity, truthfulness, forgiveness, humility modesty. Treat each other and all people with respect, fairness and justice. Continually acquire knowledge, learn and improve ourselves and help others to do the same. Take responsibility, work as a team, build relationships and partnerships based on doing the right thing. Have energy, enthusiasm, and the courage to lead. To establish and operate 5 times daily Prayer for the muslim community. Focus on the needs of the diverse Muslim community whilst ensuring services are open to all. Meet the needs of the local community by promoting health, education and employment opportunities. Provide Muslims and non-Muslims with the opportunity to learn and understand Islam, through dialogue, discussion and social interaction. Collaborating with local community organisation in contributing to the social, cultural, and spiritual enhancement of the whole community. To establish and operate an Islamic Center in the community north of McKnight in the City of Calgary. Organize religious, educational, social/family and faith-based events. Give back to the community at large through partnerships and social service initiatives. Advance Islamic and secular education. Further better understanding and appreciation of Islam among non-Muslims. Promote unity, compassion and peace.